Mridangam is an ancient instrument, a primary rhythmic accompaniment in Carnatic Music. It is popular all over the world for its melodious sound and rhythmic pattern. Ken Art Mridangam thrills the hearts of hundreds of young people, inspiring them and making their dreams come true. KENSRI believes in the implementation of Traditional Style of teaching. Learning Mridangam art has no barriers of language. The training ensures all the students to develop their skill. On completion of the training, the successful students are well prepared for their “ARANGETRAM”. ARANGETRAM:- Arangetram is a debut musical performance which takes place normally in presence of GURU, Great Vidwans, Critics, Organizers, family members and so on. The student is eligible for this, only after attaining the performing level with substantial, qualitative high standard in the field of music. The performer should be able to perform at least for 30 minutes. Create a list of Taalas they perform, Thorough training with vocal music. Mridangam is an ancient instrument, a primary rhythmic accompaniment in Carnatic Music. It is popular all over the world for its melodious sound and rhythmic pattern. Mridangam, Reference Books. System in Place: Strictly following the curriculum, approved by the experienced faculty. Weekend Programme: Proposed to have group participation from the selected students to perform in the school events. Monthly Programme: Proposed to have individual solo performances and make them participate in competitions. This will help the students to take up Junior Grade Music Examination conducted by Music University. Holiday Programme: Practical Training on Tuning of the Instrument & Technical Knowledge of playing other Percussion Instruments like, Ghatam, Khanjira & Morching. To have WORK SHOP session from invited artists. T.A.S. MANI a well known International Mridangist of our country. 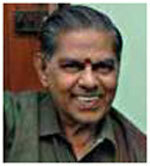 He is the first person to start Karnataka College of Percussion in 1964. He has accompanied with all stalwarts of our country and has an experience of 60 years as a Performer and Teacher. To his credit he has several awards. To name a few Sir Henry Wilson Award ,Gana Kala Bhushana, Karnataka Kalashree , Life Time Achievement award Madras Music Academy. He has also travelled all over world several times. Sri. TN Ramesh, Mridangam Faculty in Kensri School, a senior student of Sri TAS Mani, B.Sc graduate from Bangalore University, has won Mridangam endowment prize of Late Sri. T.H.Puttachar in 1971. FIRST RANK in Vidwath in 1974. Accompanied on Mridangam and Ghatam, with eminent musicians like, RA Ramamani, Balamurali Krishna, Veena Doreswamy Iyengar, TV Shankarnarayanan, Sikkil Sisters, DK Pattammal, Bellary Brothers, V.Ramachandran, Bombay Sisters, Maharajapuram Santhanam, TR.Subramanyam, TN Sheshagopalan, N.Ramani, S.Ramanathan, Rajkumar Bharathi, Mandolin U Srinivas, Kadri Gopalnath, Madurai Somasundaram, and many more. Expertise in Ghatam, Dholak, Dhol, Konnakkol etc., “A” GRADE in MRIDANGAM AND GHATAM. Programmes given over All India Radio National Programmes, Sangeeth Sammelan, and over Bangalore Doordarshan. Travelled abroad with Mani Sir several times. Other Special Occasions: Accompanied with Famous foreign musicians like Maynard Ferguson USA, Charles Mariyano USA, Chris Hinze of Holland.